Ethylhexyl Palmitate (Skin Conditioning Agent), Sucrose (Flavoring Agent), Sodium Chloride (Viscosity Modifier), Helianthus Annuus Seed Oil/Helianthus Annuus (Sunflower) Seed Oil (Emollient), Silica (Absorbent), Glycine Soja Oil/Glycine Soja (Soybean) Oil (Emollient/Skin Conditioner), Theobroma Cacao Shell Powder/Theobroma Cacao (Cocoa) Shell Powder (Abrasive), Bertholletia Excelsa Seed Oil (Emollient), Theobroma Cacao Seed Butter/Theobroma Cacao (Cocoa) Seed Butter (Emollient), Parfum/Fragrance (Fragrance), Glyceryl Dibehenate (Skin Conditioning Agent - Emollient), Tribehenin (Skin Conditioning Agent), Glyceryl Behenate (Skin Conditioning Agent - Emollient), Mica (Opacifier), Polysorbate 20 (Emulsifier), Linalool (Fragrance Ingredient), Limonene (Fragrance Ingredient), Coumarin (Fragrance Ingredient), Ethylene Glycol (Humectant), Denatonium Benzoate (Denaturant), Citric Acid (pH Adjuster), CI 77499/Iron Oxides (Colour), CI 77491/Iron Oxides (Colour), CI 77891/Titanium Dioxide (Colour). 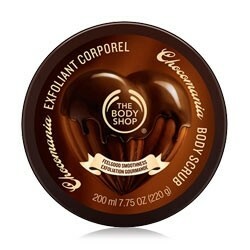 I cannot say enough good things about this,it at first looks so yummy and choclaty,it is really dark and has a gorgeous chocolate scent. It is easy to use and leaves skin really soft asit contains oils which also hydrate you skina dn the subtle scent it leaves behind is great. i am going to use this in my valentines pedicures.